Every now and then, I get in the mood for something classic and very odd. A show in which the genre is never quite clear but it’s fascinating to watch. Sapphire and Steel ran from 1979 to 1982 on ITV. There are 34 episodes most written by Peter J. Hammond, and one story set by Don Houghton and Anthony Read. 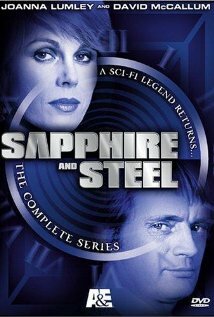 It’s the story of two agents, called Sapphire (Joanna Lumley) and Steel (David McCallum). It’s never quite clear what Sapphire and Steel really are. Not human, possibly alien, and perhaps not even corporeal and these bodies are merely hosts. In any event it is the job of these hosts to fix problems with time. There are 34 episodes covering six main stories, “Assignments”. These include time slips, a strange creature caught in photographs, time reenactment spilling over into modern day. It’s creepy and fun. Time travel? Not always and not exactly. In Sapphire and Steel time is a thing that can be broken into or messed around with or altered. There are things outside of time that can break in or cause harm. Yes, it’s vague. And it’s strange, but it’s a wonderful show. What keeps it going is the fact that the stories are good and the acting is top notch. With a small budget and minimal effects it’s still an engaging story-that’s what good acting does. Assignment 4 involving strange evil in photographs is my personal favorite. The sets are minimal with only a few terrifying effects to carry the story and some great acting by the guest stars. Creepy cardboard kids ! Men with no faces! Mysterious screams ! Sapphire has the ability to touch people or objects and find out their feels and past histories. She also seems to have some sort of telepathic ability. Steel is more methodical. He figures out the problems in time and how to fix them. A lot of the fun is listening to Sapphire and Steel’s banter and seeing a young David McCallum looking dapper. These include time slips, a strange creature caught in photographs, time reenactment spilling over into modern day. It’s creepy and fun. Originally, Sapphire and Steel was intended as a children’s show-though that idea seems dropped by the end of Assignment 1. It starts off a bit slow but if you stick with it, it’s a real treat. It’s available on DVD(There’s a region 1 box set that I know of. There are also Sapphire and Steel audio plays produced through Big Finish. If you are a fan of audio dramas, Big Finish is worth checking out. They have a wonderful series of Doctor Who audio dramas and Blake’s 7. Howdy! I have another SF Obscure post. I’ve never seen this, but for a young David McCallum, I might hunt it down. I’m currently enjoying the Man From U.N.C.L.E. on MeTV. It’s definitely worth checking out…and McCallum is great. Saw the railway station story when I was a kid – terrifying and compelling. Got the DVD when it first came out, and never regretted it. One of the best TV fantasy series. It’s a real treat…I was sorry I missed it for so long, because it should be known by a wider audience. A definite classic. A young David McCallum *sigh* I fell in love with him in Man From U.N.C.L.E. Talk about young . . . But, alas, this one I have missed. I will have to see if I can find a copy. Sounds fun! Thank you. I LOVED Sapphire and Steel, even though the railway episode gave me nightmares. I had the videos, and I have the books, but I’ve yet to pick them up on DVD.